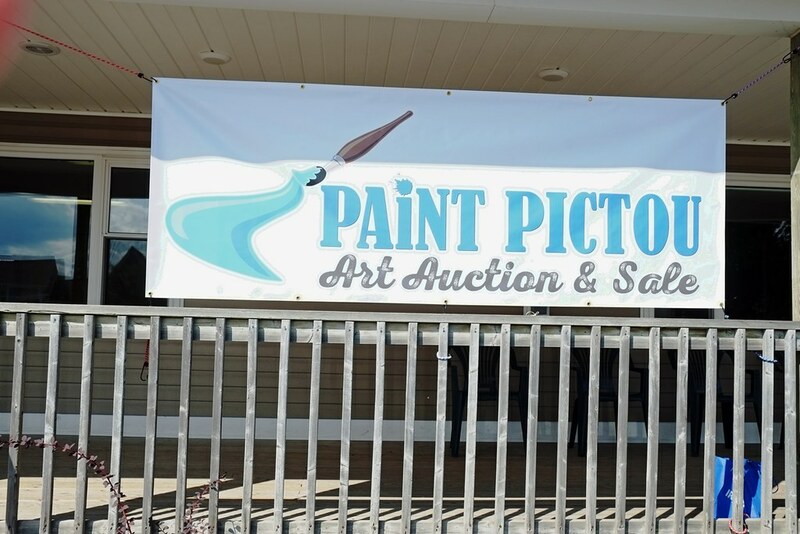 Paint Pictou happened here last Saturday, and the 17 participating artists could not have asked for a better day with blue skies, dazzling sunshine, and pleasant temperatures. Welcome to week 344 (9/14/2017) of Travel Photo Thursday. Come along as I introduce you to these lovely folk and the gorgeous paintings they laboured over during this fun event. All links are DoFollow. 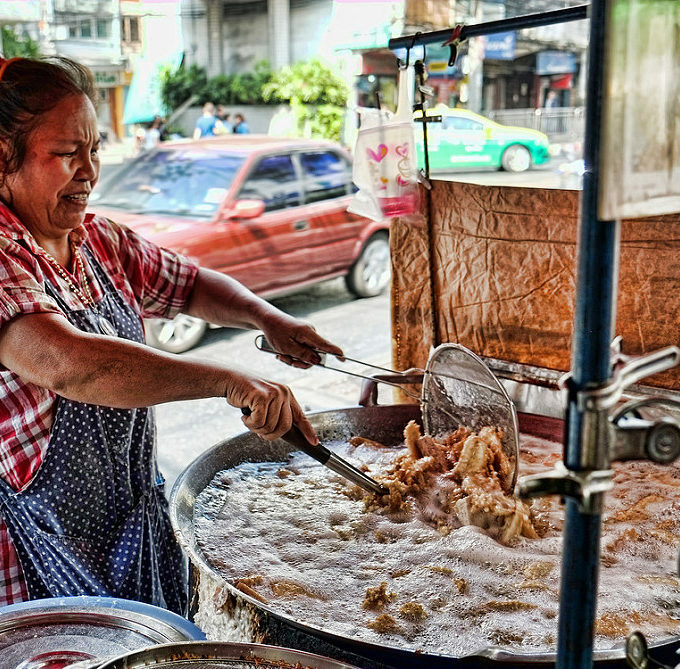 That means I am sharing SEO link juice with you; a good thing! 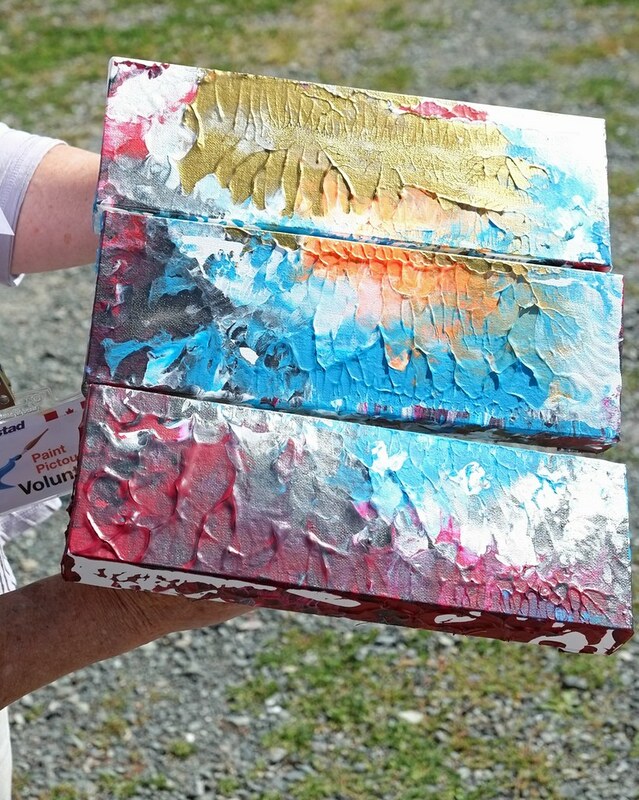 Seventeen painters participated in the Paint Pictou event and painted in numerous locations throughout the waterfront area. 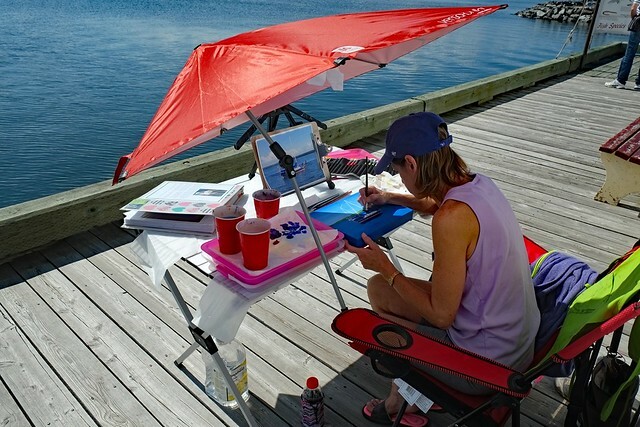 Usually, the easels were manned, but sometimes the artist stepped away for a moment or two. Then, as a spectator, I got the pleasure of gawking at the painting from every angle without feeling I was being overly nosey. Each painted two pieces to be auctioned off at the end of the day through a silent auction. Each painter listed the minimum sale price and those who wanted to purchase could bid against each other until each bidder hit their limit. 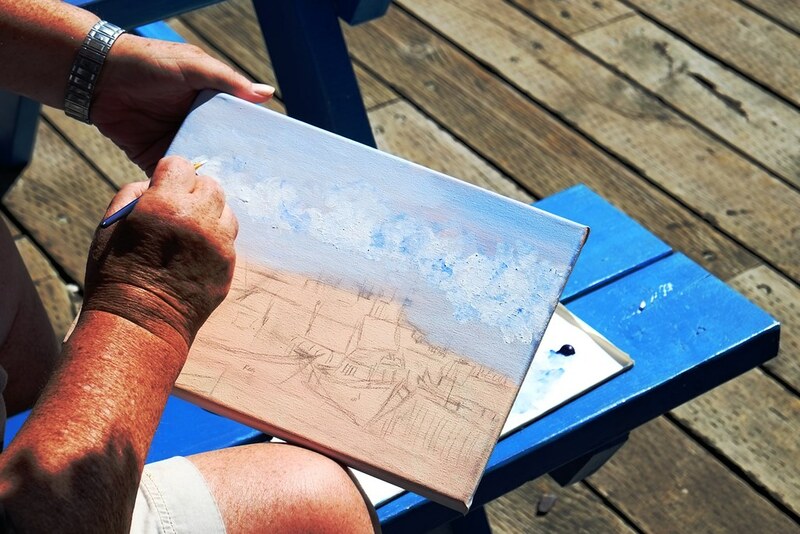 Dawn is relatively new to the painting world and her enthusiasm for having found her talent was contagious. 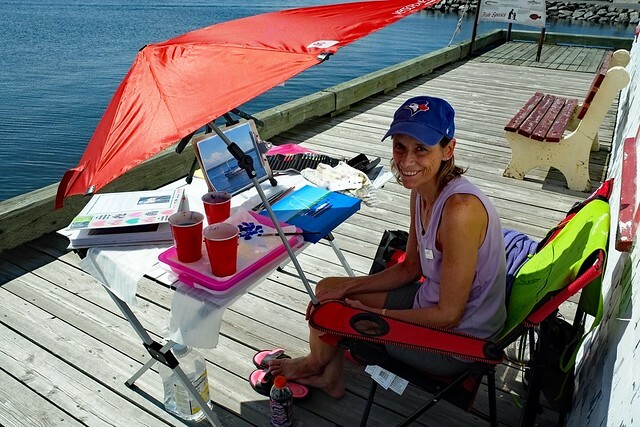 Initially, she didn’t think she was good enough to participate in Paint Pictou but other local painters encouraged her to throw in her brushes. It was her wedding anniversary and her hubby had surprised her with all of the gear you see in the photo. The yacht she was painting was still anchored in the harbour, but of course, moving in circles, so she had taken the photo to keep her creative juices flowing. This was two first of two paintings she would complete and add to the events silence auction. Dawn’s book of completed paintings shows a lot of talent, and it was refreshing to witness her love for her craft. 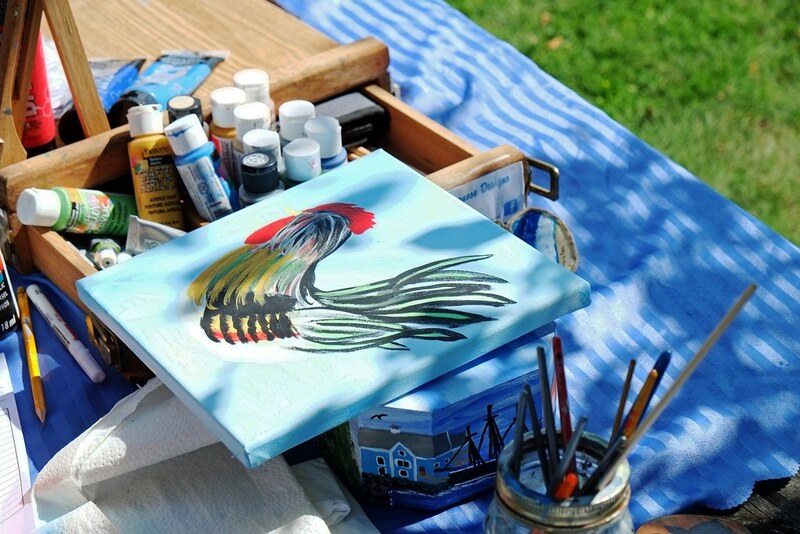 Nadine Hughes was busy painting a colourful rooster when I wandered by her “studio”. Believe it or not, Nadine set the opening bid at a mere five dollars. 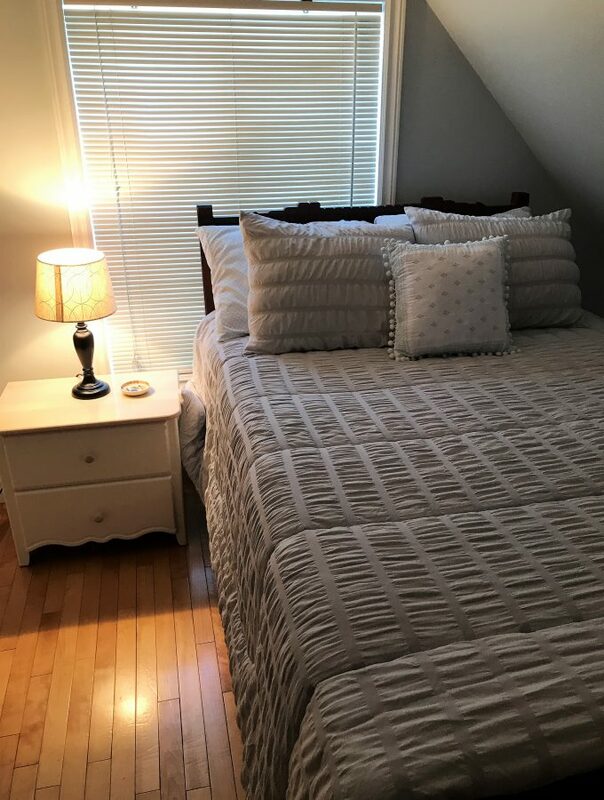 If you’d like to see more of her work, check out Nadine’s Facebook Page, Bluenose Designs. This was the only male artist I found in my travels around Paint Pictou. I didn’t get his name, but we did chat for quite some time. 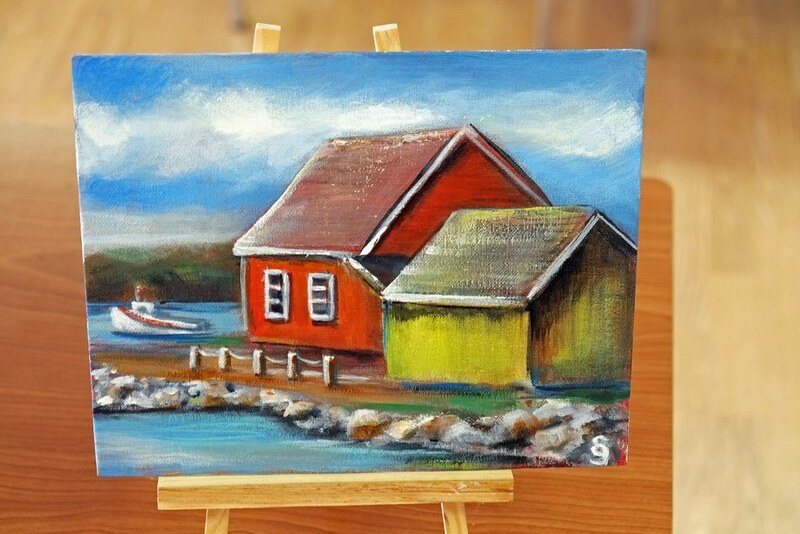 One of his subjects (a red boat) decided to leave in the middle of his painting session with no warning. That made for a few giggles. I love the puffy clouds. 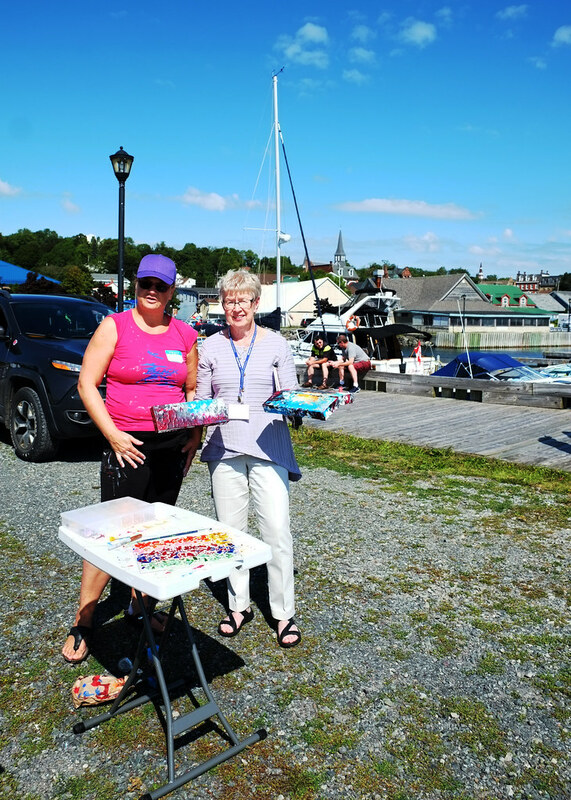 Annette Sowers (left) appeared to be the only Paint Pictou abstract artist. I adore the colours. The lady posing with Annette did a great job of picking up the finished pieces to deliver to the silent auction building. 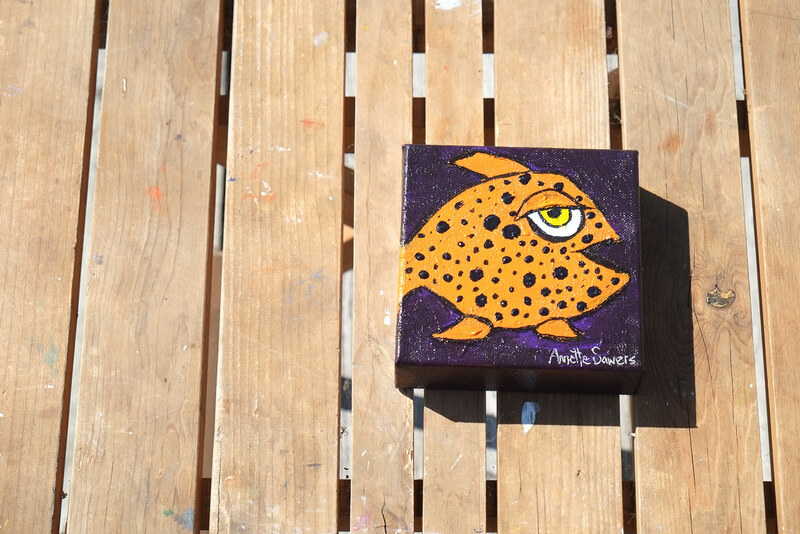 Don’t you love Annette’s cute, polka-dotted, whimsical fish? I didn’t bid on any of the artwork, but that doesn’t mean I wasn’t tempted. 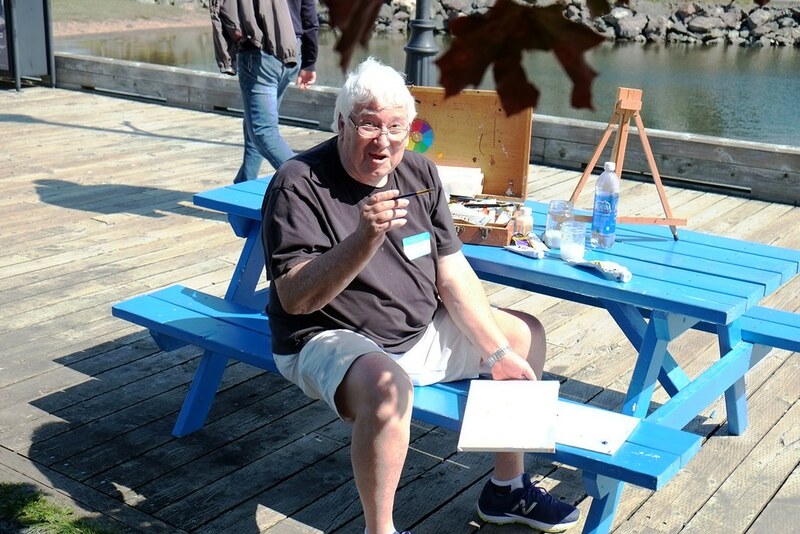 This was the second year for Paint Pictou and hopefully, it has become an annual event. Rubbing elbows with these artists was a treat. They were all so friendly and eager to talk to everyone who visited their easels. This was not the first time I have been to an event like this in Nova Scotia. A few years ago I was fortunate enough to be in the province when the artists invaded Peggy’s Cove for a day. You can read my post here. Have you been to a similar event elsewhere? Let us know in the comments. I like watching painters work. Sometimes fast, sometimes slow, but usually noticeable when I return after a while. What a great event to showcase their creativity. What a fun event to watch! I love that you can interact with the artists and watch the progress. Many towns should do more events like this to show off the local artists. I would have bid on that one too. No I’ve never seen artists at work en-masse. Looks like a fun and happy event. What a cool event! And it looks like it was beautiful weather for it!I’ve usually only seen one or two painters out before but never this many. Glad it’s had such success. What a perfect day for one of my favourite activities! Looks like a fabulous day to wander around the waterfront, people watch and enjoy all the goings on. I do love that polka-dotted fish, Nancie! How wonderful to be able to watch the artists work. 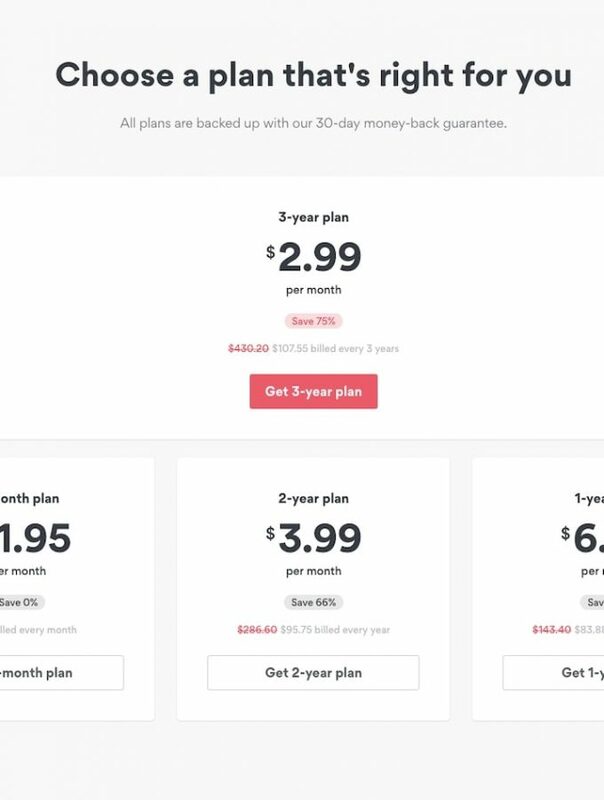 The rooster looks interesting, but agree with your first choice. You know my world is topsy-turvy when it takes me three days to remember I forgot to comment on your post. Beautiful photos and that rooster would have gone home with me!